Here’s why concussions deserve our attention. Mid aged medical doctor reviewing x ray of african patient. December 11th, 2017 | Pyschologytoday.com – For decades, getting up after a hard hit has been rewarded with a badge of honor for mental and physical toughness. But nowadays, every hit is coming under scrutiny, slowing games and forcing some athletes into early retirement. With football participation rates decreasing, the abundance of coverage about concussions has certainly affected the sport. This begs the question, “Are we taking concussions too seriously? No, we’re not. While the sports culture is beginning to change, I would argue we are still not taking concussion seriously enough. Almost half of homeless men had traumatic brain injuries. Teenagers who have had a concussion also have higher rates of suicide attempts. Head injuries can make children loners. Teen concussions increase the risk of depression. Another grave concern is the condition known as Second Impact Syndrome or sudden cerebral swelling that may occur when a second concussion occurs while the brain is recovering from injury. Most people don’t realize the 50 percent fatality rate among individuals who suffer this fortunately rare event. Of the survivors, 100 percent will have permanent neurological impairments. Another seemingly obvious realization is that the hit that may have caused concussion-like symptoms, was not the first. In fact, if the athlete participated in practice, particularly in American football, the head had sustained numerous, if not thousands of sub-concussive hits prior to the one that caused the symptomatic blow. Then, think of all the other times the individual was hit in the head previously in life during other activities like skiing, cycling, falls at a young age, fist-fighting, or in other sports and you can begin to see a straw that’s about to break the camel’s back. When the brain suffers a hit, but symptoms do not arise, we call them asymptomatic or sub-concussive, because slight damage may have been caused but not felt. These series of repetitive hits cumulatively may lead to Chronic Traumatic Encephalopathy (CTE), which is a progressive degenerative disease of the brain found in athletes with a history of repetitive brain trauma, including symptomatic concussions as well as asymptomatic subconcussive hits to the head. Autopsies reveal CTE is associated with a build-up of Tau protein and looks like a brain afflicted by Alzheimer’s disease. CTE, the focus of the current NFL lawsuits among active and former players, may also be affected by lifestyle factors that can add stress to the damaged brain, including smoking, alcohol abuse, drug use, poor diet, and lack of exercise. Medical science has not yet fully uncovered why some athletes develop CTE, while others don’t. Another frightful symptom that may result from a concussion is the appearance of seizures. Seizures typically occur immediately upon losing consciousness or within the first week of the injury. Seizures are physical manifestations resulting from abnormal electrical discharges in the brain. These manifestations appear to be convulsions—when the body shakes rapidly, even violently. Perhaps one of the more devastating potential repercussions of brain injury is the damage to the central nervous system, leading to paralysis. Our nervous system is especially sensitive to damage by injury. Both brain and spinal cord injuries have the potential to cause severe and life-changing disabilities. However, the type of disability sustained depends greatly on the region of trauma. The spinal cord is responsible for information transfer between the brain and the body. It follows that injuries to the spinal cord disrupt information transfer. The position of trauma to the spine largely determines the effect of a spinal cord injury on the body. For instance, injuries to the lower half of the spine can lead to paraplegia (paralysis of the lower half of the body with involvement of both legs), while injuries in the neck or brainstem may lead to quadriplegia (paralysis of both arms and both legs). Injury to one side of the brain may lead to hemiplegia of the opposite side of the body. So before you start thinking that concussions are ruining the game, remember the games can ruin the brain. But taking adequate precautions, following adequate protocols and educating yourself will help the everyone get the most from every game. 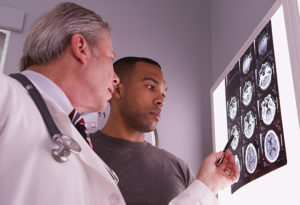 1- American Association of Neurological Surgeons (AANS), Brain Changes Can Result from Participation In One Year of Contact Sports, Evidence Shows. (April 8, 2014). http://www.sciencedaily.com/releases/2014/04/140408154105.htm.